A small bag of apples, freshly picked. A giant sunflower, on a long stem. It is gifts like these that are a reminder of what a joy teaching can be. Gifts like pictures drawn, just for me. Little reminders of the reasons I became a teacher. I love apples and sunflowers: click here to read another post named apples and sunflowers! Oh, so sweet! I love when that happens! I love the beautiful simplicity of this post! However, for me, I have had one too many hand drawn pictures. I love them, I really do, but I don't know what to do with them all. Some people tell me to take a picture and I've gotta think that doesn't do it justice! And yet, I can't keep all of them! It's funny how the simple things can look so beautiful when by themselves. 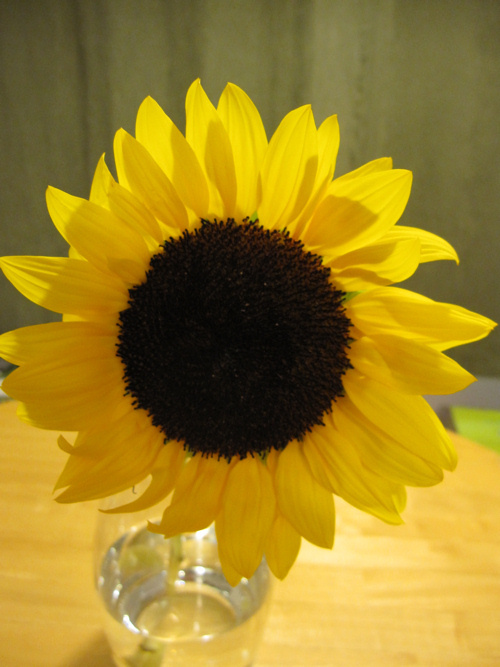 Sunflowers tend to get lost among other flowers when in a bunch, but by themselves? They shine brighter. Oh so pretty! Those thank-yous are the best. What a wonderful gift! I should do that for Sprout's teacher. Being a newbie school parent, I really have no clue what I'm doing when it comes to these things! So sweet and simple. I love how children express their affection. Those simple but oh-so-meaningful gifts. I love how you see them — the small blessings that we would actually miss so much had they not been given. I know I would love those gifts. Beautiful and so true! I miss those precious gifts. I'll take it even a step further and say there's even something really special about a tiny handful of dandelions presented by an innocent child isn't there? I even miss those…Lovely post and lovely photo! Teaching is more than an occupation and it is a blessing to have passionate docents in this art form we call life. Well I love these things also…but my teaching has only been with my own children, but I appreciate all teachers. There is nothing greater than teachers who love their work. This makes me miss my teaching days! There really is something about the simpleness….pureness of the gifts from children.